I'm sitting in the airport (or Aréoport as it is called here) in Paris waiting on my plane and as I sit I have been 'people watching'. Airports in general are very interesting places, full of a wide variety of people from all different walks and nationalities. Right now I am sitting next to a young jewish man and as I listen to what is going on around me I can hear at least 3 or 4 different languages (none of which are english). I have spent the last several hours trying to guess where different people are from, some it seems are from England, others are from Israel (obviously since I am sitting waiting or a plane to Israel). Sometimes it seems difficult to figure out which people are fellow americans. Some by their dress and actions, plus the fact that they are speaking english, are obviously American. While others, due to nationality or their amount of exposure to european culture are more difficult to find, recognizable only by the fact that they carry American passports. Looking around the 'Aréoport' it doesn't seem much different than DFW, granted the signs are in French (with English subtitles) but in general it is the same. The stores are all over priced, the food is not easy to find, and when found not that great. There are people everywhere trying to get to their flights and not be late, lots of security and flight crews. One remarkable difference is that the security here in the Aréoport all carry weapons, unlike in US airports the security here is actually able to respond to an crisis and take immediate action. Okay so I wrote all of that at the aréoport and then my luggage was confiscated by the El Al (the Israeli Airline I was flying on) Security people. That made me VERY mad but I couldn't really do anything. They took pretty much everything, but I'll write all of that in another note. ￼In recent years tolerance has become a word that you hear most everyday, you hear it at work, at school, on the news and sadly in some churches. The idea that we must ‘tolerate’ the ideas and beliefs of others and that we must allow them to believe whatever lie they choose is rampant in today’s society. Not only must we allow their ideas but we must allow them to indoctrinate our children with these same lies or be called intolerant which seems to be synonymous with judgmental, self-righteous hate monger. This idea of tolerating lies and allowing people to believe whatever ‘truth’ (meaning lie they choose to believe) they choose, is not compatible with Christian doctrine or the teachings of Jesus and the Bible. Jesus proclaimed that He was The Way, The Truth and The Life and that no one could come to the Father except through Him. TOL'ERANCE, n. [L. tolerantia, from tolero, to bear.] The power or capacity of enduring; or the act of enduring. Diogenes one frosty morning came to the market place shaking, to show his tolerance. 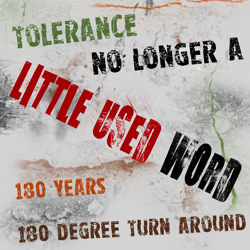 In the last 180 years the meaning of tolerance has changed drastically. Tolerance used to mean the ability to endure, in Eph. 4:2 Paul implores us to “[show] tolerance for one another in love.” That word tolerance is anechō in the greek which means ‘to hold up’ and is often translated as ‘suffer’ or ‘bear with’. According to the Bible tolerance isn’t allowing people to believe whatever they choose but rather tolerance is the ability to suffer and bear with your brother. Another interesting thing to note in the 1828 Webster’s definition is the note at the bottom “Little used. But intolerance is in common use”. In Noah Webster’s time tolerance was not a common thing, people did not tolerate or allow things with which they strongly disagreed. Disrespectful children were punished, heretical ideas were severely dealt with and new ideas were strongly discouraged. Like Webster said, tolerance was little used but intolerance was common. In some ways this intolerance was a bad thing. The suppression of new ideas both scientifically and socially contributed greatly to the delay in the discovery of many foundational truths in modern science and the understanding that all men are created with equal worth in the sight of God. In other ways this intolerance was good, the punishment of false (not different but false) ideas, teachings and rebellion (in both children and adults) were practices that have a very Biblical basis and are sadly lacking in today’s society. As a Christian I am called to be an imitator of Christ and look to Him as my example for how life is to be lived. Looking at the actions of Christ, I see that the things He did would be called intolerant by today’s society. Christ came to save us from our sin not ignore it, He came not to condemn us but rather to redeem us. His is not a lifestyle of allowing people to wallow in their sin just because He doesn’t want to offend them but a lifestyle of looking beyond what feelings and looking to the condition of the soul. If the Truth is offensive it is because the Holy Spirit is convicting us of the sins in our lives. This is a 180º turn, just like in so many other areas our culture has “exchanged the truth of God for a lie...” we have decided that it is better to suppress the truth than to hurt someone’s feelings. Despite knowing that God is perfect and holy, and despite knowing that His Word is eternal and true, we have decided that we the creature know better than God our creator what is true. All this talk of ‘personal truth’ and relativism is just the type of thing that Paul was talking about in verse 21, futile speculation. We speculate that life evolved from nothing, we speculate that maybe life doesn’t begin until after birth, we speculate that immorality isn’t sin if both people feel it is okay for them. The collective heart of our world is being daily darkened, every day some ‘new truth’ is discovered and the so called enlightenment of civilization progresses in leaps and bounds toward destruction. “My son, if sinners entice you, Do not consent.” (Pr. 1:10) to consent means literally to think with another, or entertain their thoughts and ideas. The idea of ‘tolerance’ today is very enticing, I mean who doesn’t want to live at peace with all men, who really wants to suffer persecution because of what they believe. This idea of tolerance of anything and everything for the sake of convenience is very appealing but also very wrong. Jesus said that as His followers we would be persecuted for His sake, He said we would suffer hardships and mocking speech but that if we persevered we would receive a crown. The other day I was listening to the radio as the host was introducing the song Joseph's Lullaby (by MercyMe) and he said something that really got me thinking, he said that sometimes as a child Jesus probably called Joseph 'daddy'. Now the Bible doesn't say whether or not that happened, but it seems to me that it is very probable that it did happen. I mean that is the natural tendency of a child to call their father (whether their real father or adopted father) 'daddy' and Jesus was fully man, born just like you and me. So I was listening to the radio host and getting ready to listen to Joseph's Lullaby, which is one of my absolute favorite 'christmas' songs, and I started thinking, how much God sacrificed to allow His only Son to call another 'daddy'. I continued to think about this all throughout the song and for the next few days. Now I don't for a moment pretend that I understand all that is involved in being a father, nor do I completely comprehend all of the emotions that are there, but as I have matured and grown I have come to better understand how my father feels about me, and through that understanding I can begin to understand how he feels. I know that if I were to call someone else (aside from God) my father it would break his heart. So how much more must it have broken God the Father's heart to hear His Son call another father. Out of all the names of God, I think that of Father is one of His dearest. The Bible tells us in countless places how much God cares for children (Luke 16:18), and how He desires the orphaned cared for (James 1:27), and how He is the father to the fatherless (Psalms 68:5). All of these things say to me how much God desires to be called Father, and how good of a father He is. Numerous places in the Bible (Exodus. 20:5 and Deuteronomy 5:9 to name two) it says that our God is a jealous God and He does not suffer another to take His glory, but He allowed Joseph to be Jesus' earthly father, to me that says a lot about the immensity of the gift that God made in sending His only Son. All of this is yet another example of how great is the love of the Father towards us, and how great is the sacrifice He made to call us His own. This is just another reason why I am eternally grateful for what Jesus did for me on the cross, and what God did for me in allowing His Son to come and give Himself for me. With the coming of the christmas season I have been contemplating why I celebrate Christmas. I mean it is so easy to get caught up in all the songs, the decorations, and all the gifts and traditions that sometimes I forget what Christmas is all about and why I am celebrating it. I encourage you to take some time in this busy season of the year and think about why you celebrate Christmas. Whether you share your reasons or keep them to yourself taking the time to think it through and organize your thoughts will be well worth your time. The first thing that comes to mind when I think about why I celebrate Christmas is the reason that most christians probably think of first, the birth of Jesus. Now whether or not he was actually born on December 25th is irrelevant, to me it is the celebration of His birth, not the exact day. One of the reasons that I celebrate Jesus' birth is because it is one of the most improbable, impossible, unimaginable things that could ever happen in the eyes of the world. Who would believe that a God who has all power and all authority would humble Himself to become like one of His own creations? Who would ever consider that He would be born in the simplest of abodes and have a feeding trough as a bed? Yet Jesus did all of this for us. In one birth hundreds of years of prophecy's were fulfilled, the Savior of the world was born against all the odds. So I celebrate Christmas because of Jesus' birth and all that it means. When I continue to think about Christmas one obvious thing that comes to mind is the one thing that every little boy or girl thinks of, gifts. Who doesn't like to receive gifts? But why do we give gifts at Christmas? I can think of a couple of reasons. First, as a reminder of the gifts given to Jesus by the magi, gifts that foreshadowed what was to come, and provided for what was at hand. I also think of a gift given on the night Jesus was born, a gift that saw it's fulfillment years later as He hung on that cross with the sins of the world on His shoulders. A gift that I cannot comprehend or understand, but a gift that I have accepted, the gift of God's only son to die for my sins. A gift of grace and mercy and a gift of love. Many people think of Valentines as the holiday of love but I have to disagree. Christmas is a holiday and a celebration of love. God's love for His people. When I think about gifts at Christmas I think about the reason that we give gifts, or at least the reason that we should give gifts. As an expression of our love for one another, to bless one another and to show the true reason for Christmas, Jesus. There is a song by Steven Curtis Chapman called "All About Love" and the title is so very true, as a Christian everything that I do should all be about love. God's love for me, my love for God and my love for my fellow man. If you think about it Christmas, and Christ's birth, isn't about the birth but about the gift. The gift of God's love and forgiveness. So as I move into this season of gifts and Christmas music, decorations and warm fires, my goal is to remember what Christmas is all about and share the love of God with others around me. Through the carols that I sing and the gifts that I give I seek to give God glory. And like the star in the dark night sky so long ago, I hope to point people toward Jesus, who came to earth as a baby, and gave the greatest gift of love anyone has ever given. Today I have been thinking about the state of the Church and our nation. I have been thinking about how we can change our nation and what is required for us to move into what God has for our nation. One of the many things that has gone through my mind is that God wants us to be completely dedicated to Him, He wants us to be Concecrated to Him. A couple of years ago I wrote a article of sorts about Consecrating the Church and I found it today and thought that it was time to bring it out again. Take My Life and Let It Be A song by Frances R. Havergal. Take my life and let it be Consecrated, Lord, to Thee; Take my hands and let them move At the impulse of Thy love. Take my feet and let them be Swift and beautiful for Thee; Take my voice and let me sing, Always, only for my King. Take my lips and let them be Filled with messages from Thee; Take my silver and my gold, Not a mite would I withhold. Take my moments and my days, Let them flow in endless praise; Take my intellect and use Every pow’r as Thou shalt choose. It shall be no longer mine; Take my heart, it is Thine own, It shall be Thy royal throne. Take my love, my Lord, I pour At Thy feet its treasure store; Take myself and I will be Ever, only, all for Thee. Today’s Church must rise up and Consecrate it’s self unto the Lord. We must remove all sins from our midst not because it is required for salvation, but for three other reasons, which I would like to discuss in more detail, these are 1.) As an act of Gratitude, 2.) To enable us to stand before our enemies, and 3.) To prepare for tomorrow. So what shall we say then? Will we say that since Christ has given us grace we will “live life to the fullest” or will we say, “Father not my will but Yours”. What will you say? Christ has cleansed us of all unrighteousness (1 John 1:9) by the washing of the water with the word, so that He might present to Himself the Church in all her glory. Who doesn’t want a perfect and spotless bride? A bride that is holy and blameless. For this reason we must sanctify ourselves though the Word of God, that we might become the holy and blameless bride of Christ. Ask any bride-to-be on the night before her wedding and she will say that she wants everything to perfect for her wedding. She will want her dress to be perfect and beautiful, and she will want herself to be perfect and beautiful. So I ask again, What more can we do than to offer ourselves a living sacrifice and consecrate ourselves unto the Lord? Imagine: it is 1314 A.D. and you are in the army of Robert the Bruce, you are fighting for the rightful King of you country, however you do not have on any armor and you are carrying several burdens. You might wonder how you are able to stand and fight while carrying these burdens, and you are right to wonder because you can’t. A knight can’t go into battle loaded with stuff and without his armor. Neither can a Christian go into battle and fight the evil one while loaded down with sins and without his spiritual armor. This is the second reason why the Church must be re-consecrated unto the Lord. If we as a body are going into battle carrying our sins and leaving our armor how can we expect to stand strong against the wiles of the devil? We are instructed in Romans 6 to put on the full armor of God. When you stand before an enemy you must do so with courage and with power. Imagine: the smallest weakest guy in school standing up for what is right against the biggest strongest guy in school. Would the big guy think that the little guy was very dangerous? Of course not he would laugh in his face and ridicule him in front of the entire school. Now imagine that the little guy is ready to make a defense against everyone who asks him to give an account. Imagine he knew karate and so could beat the big guy. Now consider your average Christian, they don’t know what they believe, they are apathetic about what their faith. They are sort of like the wimpy guy that doesn’t know karate, they don’t have a chance whenever someone challenges what they believe. They are not “ready to make a defense to everyone who asks them give an account for the hope that is in them [paraphrased]”, today’s Church must learn what they believe and be able to give an account of it to whoever asks. The meaning of sanctification is. So in order to become consecrated we must go through the process of sanctification and set ourselves apart for a sacred purpose. In part 1 I discussed that how consecration (sanctification) should be done as an act of gratitude, in part 2 I talked about how we must be consecrated (sanctified) in order to stand before the enemy, remember how I talked about the knight without armor and loaded with stuff and how he can’t do battle? Now in part 3 I would like to talk about the reason for sanctification, which is the process of consecration. So you see how the process of sanctification takes a lifetime and even then is not complete no matter if you live to be 200 years old you will still not be completely sanctified. For as long as we are still in our physical, carnal bodies we will not be completely sanctified, however we must continue to “read the Bible, Pray every day so we can grow, grow, grow” we must continue to strive for purity and holiness because that is what it takes to be a living sacrifice. We, the body of Christ, his Church must prepare ourselves for tomorrow. For we are the bride and tomorrow is our wedding day, we must cleanse and prepare ourselves for our Savior and Lord. If we want to be ready we must consecrate ourselves unto the Lord and dedicate ourselves as living sacrifices. So the question I ask you is this, Are you ready for the Lord to do wonders? Today on my way home from work (a long 2+ hour drive) I saw a most amazing work of art. It was clear blue with clouds on the horizon and bright sunshine lighting everything up. directly in front of me the moon had risen early and was sitting just above the clouds, almost as if they were a throne. In front of the moon and clouds just barely visible was a perfect rainbow, it was almost like an illusion, like it wasn't entirely there. as soon as I saw this I was just amazed that God would create such beauty in an everyday thing. That He cares enough about His creation to take joy in making it more beautiful is a proof that He is a creative and loving God. the skies proclaim the work of his hands." Today is a much shorter post. Open hearts in the campers (this week will be a mix of church kids and non-church kids so there will be some hearts that need to be softened before they receive what God has for them at this camp. Pray for protection of all the camp equipment and property, the enemy is attacking this camp and has been all summer, lots of things have gone wrong and stuff has broken that was in good condition. The enemy wants this camp shut down and destroyed so please pray for all of our equipment and property. (Examples of what has gone wrong: One of the camp trucks has been not working off and on for the last few weeks, My keyboard had problems [God healed it!!! ], the AC in the boy campers cabin froze and flooded, a window got broken [accidentally], the bus has had problems, a kid got hurt three weeks ago [slight concussion and he had to go home], several kids have been exceptionally bad [even kids who are by all accounts usually well behaved], lack of counselors for several of the groups) I list all that not to complain or dwell on the bad but those are things that have happened and God has made a way for us to get through it. Please pray about those types of things and protection from them. Pray that God will touch these kids lives through the Staff and Counselors, We want them to leave here changed and on Fiyah! If you get a chance I would love to talk on tuesday afternoons (1:00pm - 4:00pm). or just send me an email. I hate being out of touch with my Real family and all my Friends. Tomorrow I will be running Archery, I'll try and get a few pictures. The campers will also be making a walking stick at craft, doing some of our high ropes elements (cat walk, zip line, etc. ), and playing horseshoes. 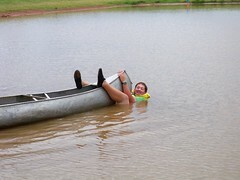 Then we will have swimming (which I won't be doing) and then then evening service. Tomorrow is also my afternoon off so from 1:00pm till 4:00pm I will be resting (either watching a movie or taking a nap) so if you want to talk (chat, phone) that is the best time for me.